Many years in the future the world will be changed forever more. J.M. DeMatteis will be imprisoned for punching David Blaine in the face. Andres Guinaldo will be imprisoned for paying J.M. to punch David Blaine in the face. And DC Comics will just sit there, impassively, and write everyone a check dated for September, 2014. To QUOTE Abraham Lincoln: 'The best thing about the future is that it comes one day at a time'. So there they were -- the remaining members of the Justice League Dark -- trapped in an unnamed mystical location five years in the future. When suddenly, out of the wide blue yonder, they come across an old English magician called Eric something-or-another! Who, coincidentally enough, also wants to get out of this mystical location that knows know bounds. And do they succeed? No. I'm not telling you anything, pal. Yet what I will say is that Etrigan the Demon is always right, even if he is one hell of a savage b*stard. 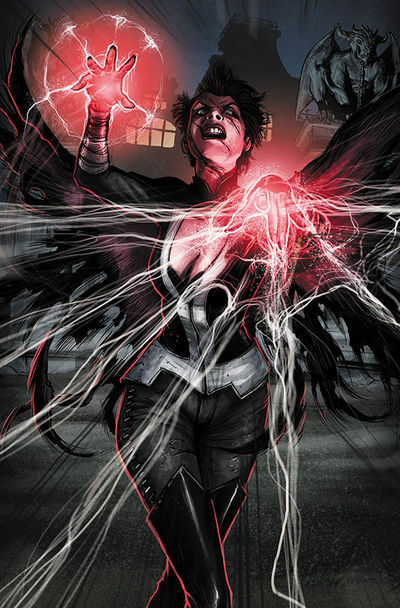 Overall I'd say this installment of Justice League Dark was pretty much a hit and miss affair. Now where its hits are concerned, I best mention that I loved the artwork provided by Andres Guinaldo -- honestly, it's really growing on me -- as well as JM's fairly intriguing story-line, that was only made better by some of the revelations he had in store for us. For example, I did like Night Nurses romance with Black Orchard, plus Etrigan's romance with Zatanna. And despite these two relationships begging the question -- why? -- at the same time it was nice little touches like these that made this chapter more digestible to follow. Now with all due respect to everyone involved, I'm afraid to say there was no point picking up this issue whatsoever. Even though it did tell a fairly intriguing tale, and I was very happy to see Etrigan's and Black Orchid's inclusions, apart from that, well, why bother? 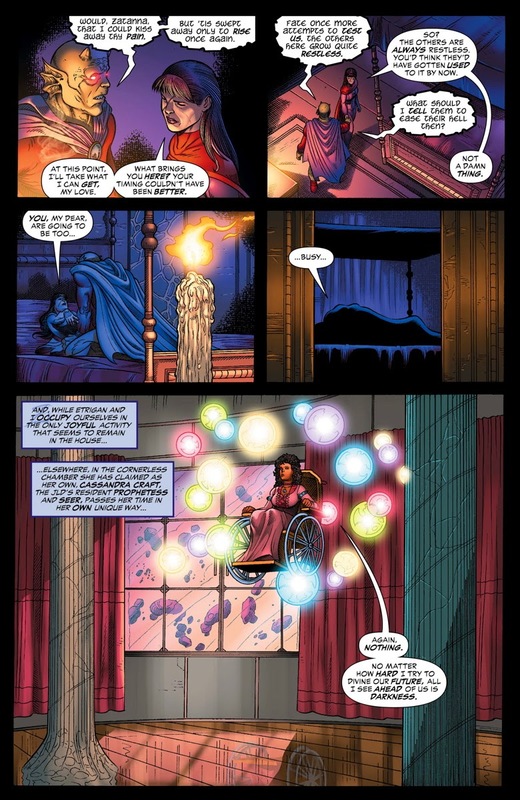 It never added anything to Futures End or the Justice League Dark ongoing series, except to allow Asa to thank Zatanna for saving her life last issue. Also, what the hell has happened to Swamp Thing, Johnny, and Deadman? Or have they been bumped-off in an installment I haven't picked up yet? Essentially this escapade is about a group of people who are stuck together and are dying to break free. So with that in mind, dear reader, how about I musically compare it to the Stealers Wheel classic, 'Stuck In The Middle With You'? Just think of Etrigan as the proverbial 'Reservoir Dog' ear chopper, wink-wink! Something else I can easily compare this comic book to is how the roughest man in it was always fairly correct with his instincts. Well, Etrigan was pretty on the money at times, wasn't he? And do you know what? Etrigan does remind me of 'The Amstrad killer' seen in that picture provided. Yeah. Him. 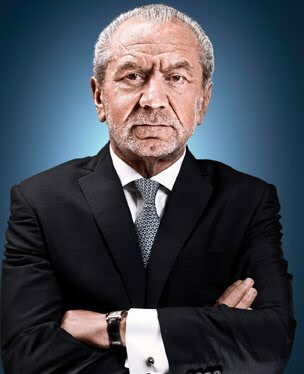 The money grabbing Donald Trump of England... Alan Sugar. At the very end of this comic book Etrigan does something rather drastic to a prospective member of Justice League Dark. So just for fun, can you guess what he does out of the following eight scenarios? He offers them their money back for appearing in this issue. He sticks out his tongue and tries to amuse them with his impression of a hammer liking Miley Cyrus. He chops their head off with his razor sharp claws. He abuses them by touching their bellybutton with his thing. He says to them 'Go and f*ck yourself', for no apparent reason whatsoever. He puts on a dress and orders them to do likewise. He hums the Swedish national anthem in Swahili. He stares at them blankly and does absolutely nothing.